We have had very big waves here on the north coast for the last 3 days which is most unusual. The government closed the beaches for 48 hours and ordered all boats to be hauled out of the water where possible. In spite of the police patrolling the beaches, some people went swimming and an American citizen was drowned at Rio San Juan. A very large catamaran was overwhelmed by a large wave and sank without trace in Sosua bay. The seas are dying down now but no diving for us this weekend!! Surprising this cold, what is going on? Yesterday was breezy, Santo Domingo was unusually cold, specially in the morning, Duarte highway reported dense fog in the morning (I have watched this phenom before, usually by this time of the year, a big mass of fog comes from the mountain and die just at the coast, it start just any time of the first time of the day, sometimes it is 8AM and suddenly comes this fog), but evening with the sun at midday, temps did not retreat. As you may now, we have (and probably the most of the rest Caribbean island) micro weathers, due high mountain chains. Santiago reported new record low, 10ºC, breaking the older 11.2ºC back on 1987. In some areas of the towns located high on those mountains, reports talk about -6ºC (21.2ºF), now that is quite shocking for a sunny Caribbean island, when normally you get around 10 or 14 ºC in those areas. Local authorities says that the system is moving towards the lesser Antilles and does not represent any danger of rain, just grab a cup of hot cocoa and enjoy! gusty winds from the north and showers rolling in from the east. Looking down to the shore we can see a very rough sea. Very interesting is the difference with William's data from Culebra. Unsurprisingly the island is green!!! After some wonderful sunny weather enjoyed by holidaymakers and locals alike, it is turning cool and we have heavy overcast. Last night was so cool that I wrapped myself in my Christmas pashmina while reading my book - never thought I would need it so soon. The winds are from the west instead of our usual direction of east. No more rain please - we have barely dried out after Noel - didn't anyone tell the powers that be that the season is over!!! But a small price to pay for living in paradise! Beautiful day over Santo Domingo, but also a bit breezy this morning, with unusual low temperatures. For us having 27ºC during the hazard of the noon (12PM) is well welcomed and I get like scratching my head asking myself "how come?". On these holiday seasons throughout December, temperatures has got no problem on reaching the forecasted low's (21ºC for Santo Domingo, even lower for Santiago and below 10ºC for Constanza micro-weather). The National Meteorology Ofice (ONAMET in Spanish) is expecting more chill effect for the incoming cold front (visible right now over Cuba, not that I am a weather guy, but is clearly for me that that thing looks like a cold front). So, back to business, one more holiday event left for us and that is the day of "The three wise men or Three Kings" that's how you English call them we call them "Los Reyes Magos" on January 6th, where children get more presents under the Christmas tree, leaving presents on the Christmas day (Dec 25) is not our main tradition but most of us follow it as well. Xmas in the DR is a green, boisterous, overeated, overdrank family affair. Since we are a lot in the first circle, 4 married sons & daughters, 12 grand children, one of them married with our one greatgranddaugther, any small intimate gathering means lots of people. To make things more complicated all the women in the family are great cooks ( also some of the men ) so that means an informal competition of wich some of us benefit to the expense of our waistline......actually, you are expected to gain 4 to 5 pounds over the holidays.....to make things worse, we are taking a 2 weeks holiday in Spain after the 27th. God have mercy. Anyway, let me wish you all Happy Holidays in a Christian spirit, it is after all a conmemoration of Christ arrival. Try and keep safe, dont drink and drive. Remember you have loved ones that love you. I don't know if there is more to come as it is still very dark at midday, but last night we took a bit of a battering - 4.3 inches of rain and very strong winds with trees down and lots of leaf litter. It is cold too - 77f and the dogs won't leave their beds. Santiago is reported to be badly flooded and 7 people reported dead according to Dominican Today. - Olga on the north coast! Well, it's dark o'clock and mop and bucket time!! The wind is about 45 mph and who knows how much rain but plenty of it, and I expect more to come!! Olga is starting to make herself known here on the north coast - about .5 inches of rain overnight but it has just started to rain in ernest. Winds about 15 knots NNE and gusting 25 knots. Surf is sounding very loud. I thought my reporting days were over until next year, not to be, Ms. Olga decided otherwise. Its 8:10 am in Santo Domingo. Cold gusty moderate winds, some 20 knts., the rain bands of the storm just arriving, looks that it is going to rain a lot inland, bad news. The center of the storm is supoused to pass over SD early afternoon, will see. More to come this afternoon. DR is right in Olga's path. Well we are getting ready for whatever comes our way (we hope). The ground is still saturated and government warnings are in place so fingers crossed. Many places haven't recovered from Noel so Olga will be a disaster!! Pray for us everyone as we will need all the help we can get! Good luck to Puerto Rica and Jamaica and anyone else affected by this late storm. HAPPY THANKSGIVING TO ALL !!!!!!! - Rain, rain go away! Please somebody - make that blob move! Since Saturday we have now had 11.7 inches of rain and everywhere is saturated. Although we were spared the worst of Noel's flooding here on the north coast, it is still raining hard. In the last 24 hours we have had 7.2 inches - 5 inches of it in the last 12 hours making 10.2 inches this week! No news yet on how people fared in the areas prone to flooding but our prayers are with them. We had a river running down the road last night that came within 6ft of the door. Yikes! That little blob off the coast has stalled and grown considerably and bears watching carefully. We had on Tue. our first (cold) front of the year, for a day or so had cool temps, light rain, northeast winds, but in the northeast of the country heavier rains, some flooding for the land is still moist from the recent Noel troubles. Yesterday and today sunny and cool temps. Will get warmer in the afternoon. The country is still reeling from the floodings of Noel. Cant wait for the season to be over. At last the sun is out. The satellite picture promises a few sunny days ahead. Thank God for that so the drying and reconstruction process can proceed. Many thanks for the words of confort. The Ocoa river is, during most of the year, a stream that is not more than a few feet wide, because it is dammed upstream to provide water for irrigation. It runs between two montain ranges for some 80 or more miles. Close to the point where it goes into the Ocoa Bay, is the small fishermen´s village of Palmar de Ocoa, a lovely small village of some 4 or 5 thousand inhabitants, where there are also some 60 or more private beach homes at the sea front. One of my sons owns one of those where we spent peacefull, restfull weekends with the family. Last Sunday that idyllic scene turned into pure hell at 3:oo AM. Due to the heavy rains of Noel, the river turned into a mile wide turrent flooding the whole countyside, the town, neighboring sites, carrying away crops, people and their belongings bridges, power lines, you name it. For days the town was isolated until work crews manage to build a ramp leading to the bridge. Yesterday, we went bringing supplies, mattresses, water, food, monies and moral support. The whole town was covered with mud, people drying their belongings still with the look of shock in thier eyes. There is a low lying area called El Salado, wich usually is just a muddy square mile or so that is now a huge lake, draining slowly into the bay. Where there were rocks now there are new streams flowing. This poor people are in dire need of help. Today being Sunday, prayers were offered in the churches for those who died. They say that 59 people died in Santa Rosa which is a barrio of Bani, south of the bridge. That is where most of the houses were lost although several other areas had people who lost houses as well. In one area part of the road has been eaten away. This evening we had two periods of rain - not for long, but the rain really came down. When will it all end? More bad news, the death toll keeps climbing for remote areas are being reached. A lot of help has arrived from friendly countries, also locally help is being distributed privately and some officially (?). One more problem, schools are used as refuges. Heaven knows when classes will resume in those areas. Still some rain, not much, but falls on saturated earth, not good. Recieved lots of emails, thanks to all. My lack of reports of the tragedy that afflict us was caused first for my lack of access to the internet and to the excelent job of my fellow correspondents. Congrats to them. The news is all bad. The death toll reached 73 this morning. some 40 missing, God help them. Comunications are being restored and isolated areas are again reachable. Crops lost and flooded land will bring trouble for everybody for months. So many lost their loved ones and their homes that there are no words to describe the suffering. Shame on those that failed to warn in time of the approaching storm!!!! We need all the help the world can give us. To those that allready responded, many thanks. A lot of work is now needed to prevent epidemics in crowded shelters. Water sanitation and prevention of mosquitoes breeding is extremly dificcult under flooding condition. Although Noel is history for us, right now over Santo Domingo is raining. Yesterday we had mostly cloudy skies, hope appeared with the first sunshine in days, right at 10:30AM, the heat sensation immediately made it a little bit suffocating. However, around 4PM it started to rain again, and heavily, apparently we are still under Noel's influence. 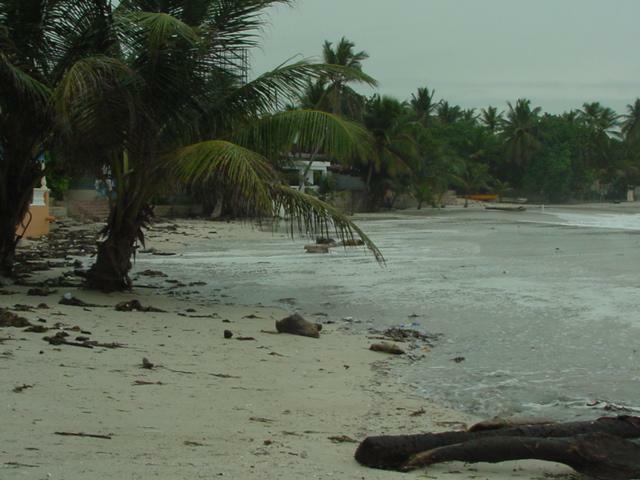 Despite the sad and catastrophe sensation, the most affected areas were towns in the south-west region and part of the north, south-east did not report any significant damage and that is where most of tourist's favourite destinations are: Punta Cana, Casa de Campo, Juan Dolio, Bayahíbe and Bávaro. Since tourism is our main attraction, it is worth to say that the infrastructure didn't suffered, so if you plan to come, go ahead, but call first your travel agency or listen to your local government recommendations. Right now, light rain. Official death toll for the Dominican Republic: 73. 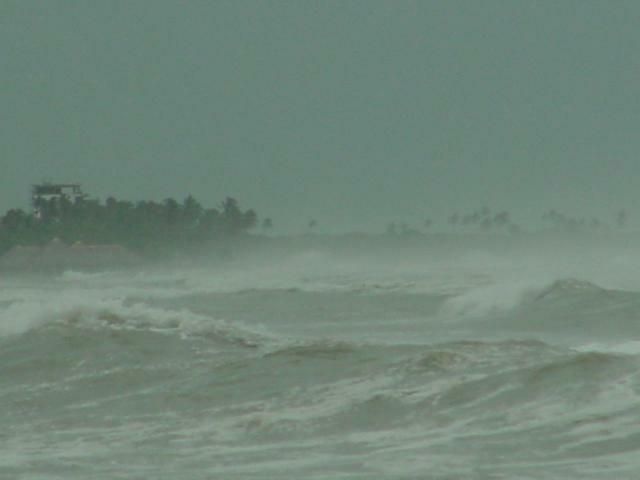 Noel has become the second deadliest storm, after Felix, which killed 103 in Central America. <it seems that the male named storms bother us more than the female. <here in Bani, in the heavily hit southwest part of the country, we have had so much rain that <i wonder if we can handle any more and it is still coming. We have been without power since Sunday night and so <i am at an internet centre writing this and using a Spanish keyboard so please excuse the punctuation mistakes. The rain started around noon on Saturday, with a thunder and lightning storm. The latter hit a tree across the street from us, fell and hit our power line and knocked out our inverter so we have been dependent on street electricity since then. Since this has been non existant, we are using a cooler filled with ice for our fridge. The rain began in earnest Saturday evening, all day Sunday and <monday. Some time <monday morning the river crested and <i think it was 25 to 30 feet above normal. When <i saw it later in the morning it had gone down somewhat but it was still a ragin torrent and still is. Several people, maybe 20 maybe more lost their houses and many more had two or three feet of water in them which is now mud. <unpaved roads are difficult to drive on so you use your snow experience as mud and snow are more or less the same for driving. According to the radio, 41 people are confirmed dead and about 40 are missing. Some people have spent three or four days on the roof of a school and some in trees waiting for rescue. The helicopters were busy today so hopefully everyone has been rescued. The bridge in Paya broke in two but was fixed by Tuesday afternoon. The bridge that was out in Galleon is also fixed. The road to Ocoa is missing about 400 metres so no one can pass there. Azua is shut off from Bani by another bridge that is down. <people who lost their houses are taking refuge in schools or with neighbours. <on <monday there were people moving their mattresses, beds, stoves and other possessions in pickup trucks to the school. The government is sending trucks with food and mattresses. Today we had a bit of sun and lines and fences all had clothes drying. In other words, it is a mess here but at least now we in Bani can communicate with the capital, if not with other parts of the southwest. <hopefully it will stop raining soon. Today on the north coast we have sunshine at last although it is still windy. I see that Venezuela will be sending aid for the flood victims and the USA has offered some help too. First of all, THANK YOU FOR YOUR EMAILS! Even Noel has gone from our territory, we still getting its influence, the land is very saturated and it can't take anymore, as I speak, many more landslide could be happening, death toll is on the 30's and probably will not stop counting until a while. I woke up very early today and found out that we are getting soaking rain on Santo Domingo. You see, the rain is our big enemy right now, as flooding will keep up if rain doesn't stop. I am very worried about this rain, I pray not another "Rio Blanco" (disaster in 2004) repeats, meanwhile, I pay attention to the news and see what else I can report. the wind is still very gusty at times. no more lives are lost in this disaster. What you see on CNN about the situation over here, is nothing compared to the reality, even at the local environment. Hundreds if not thousand of victims, many bridges down, towns incommunicated (specially on south-west region of the nation). Power lines and phone lines down in many places, towns flooded, death toll is on the 20's and counting. There were two general black outs (the whole country without power) last Sunday evening to Monday, power is being restored little by little. Is cloudy yet, and from time to time we get heavy rain (and yesterday with some gusty winds, yet). Some streets are totally flooded here in the capital. I was the whole day at work, since I work in a construction site as a supervisor, I don't have access to Internet, but I was listening to some local radio station thru my cell phone and a lot of people calling from specific points in the country counting their stories and the situation is very VERY sad. I am not trying to alarm you, but we are very hurt. Story is telling that the worst disasters of this country arise with the rain, remember back in 2004 in Jimaní? around 3,000 people dead between Haiti and the Dominican Republic, I remember that it was raining for days and days, same happened here (not avalanche yet, but could happen). Mudslides, over flooded rivers, roads incommunicated... The whole south-west region was incommunicated because there is just one road that take you there and it suffered severe damage. In the end, something happened between the National Meteorologist Office and the National Committee of Emergency, Dominicans were not prevented about this, is like our own FEMA (from USA), the authorities did not take the necessary prevention to deal with this, now we are facing a National Catastrophe, but the gouvernement has not (and probably will not) affirm it. Thank you for your mail of support, but at this time I can only tell you this. Reports are coming in of at least 20 dead in the floods. Here is an earlier report from the online newspaper Dominican Today. Santo Domingo.- At least eight people reported dead, uncalculated damage to farming and many areas without power is the tragic result of Tropical Storm Noel, which has been affecting most of the Dominican Republic since Sunday. A Naval corporal and his brother were killed in the Santo Domingo neighborhood of La Cienega, when water levels rose in a gully, according to Emergency Operations Center (COE) head, retired General Luis A. Luna Paulino, who also reported the death by drowning of a woman in the central province of Bonao. In Haina, San Cristóbal province (west of the capital) three people were killed in a landslide, according to the provincial governor. 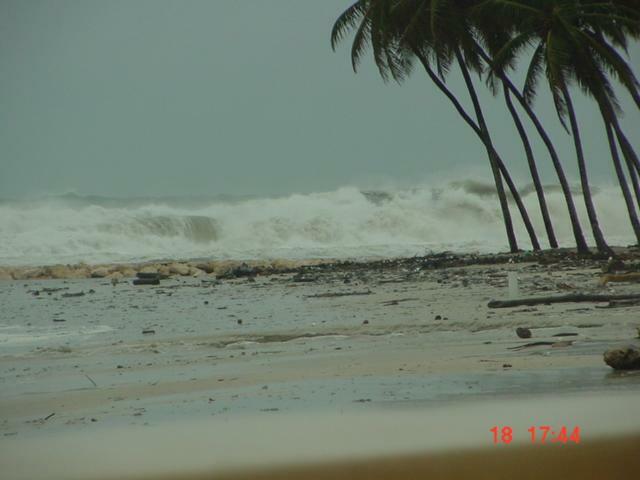 Meanwhile, in the south western province of San José de Ocoa three further deaths have been reported as a result of the heavy rains, said the COE. The COE warned that the worst was not over. The rescue corps will continue to evacuate people who live in high-risk areas because a rise in water levels is expected in the next few hours. Also in San Cristóbal, the rains also caused the collapse of an old bridge over the river Yubaso, leaving thousands of people cut off in the neighborhoods of Madre Vieja Sur, Los Javillones and 5 de Abril, Nuevo. It was also reported that the city?s Moscu neighborhood was flooded. On the Duarte highway near Villa Altagracia trees were blocking transit, while in Barahona a CODETEL telecommunications aerial was brought down, leaving the area without telephone services, according to local journalists. The heavy rains and winds have continued to batter the country all day. The National Meteorological Office warned that the flood alert for residents of low-lying area and near rivers, streams and gullies, remained in effect. The provinces of Azua, San Cristóbal, Peravia, Independencia, Barahona, Pedernales, Espaillat, Salcedo, Duarte, Maria Trinidad Sánchez, Dajabón, Montecristi, Santiago Rodríguez, La Vega, Monte Plata, El Seibo, Hato Mayor, Monseñor Nouel, Puerto Plata, Santo Domingo and the National District are on red alert. The Lower Yuna area is particularly vulnerable, said the forecasters. All boats were instructed to remain in port. Finally the services people came and fixed the generator, thank God!! !Just got my internet service working. There are reports of flooding inland, washed up (or down) bridges, etc, but since we had no power cant tell how bad is the situation. Will report when I get reliable info. It is 3:45 pm and by the looks of the "tail" of the blob will have rain until sometime tomorow. The airport at Punta Caucedo is open, one of my sons just got in from Miami. Safe and sound. Thank God for that. there's a strong and gusty wind and the sky is all in grey. it's all veiled in rainy grey. As I am writing, there is heavy rain and gusty winds, the wind thing is new today because yesterday, although a bit windy, not so much gusting like right now. The Dominicans got absolutely not warning at all, no nothing, I am very disappointed about the respond to this one, seems like we can not do nothing if a TD is upgraded to TS right on us (a bit to the south). There are currently red alert for 6 provinces including the National District and yellow alert for 12 provinces. 600 peoples have been evacuated though not located in any shelter, unbelievable. 148 houses reported destroyed by flooding. We didn't had power for the entire night, power went back on 1 hour ago, and as I am writing, we lost it again, we are running on a generator. After a very dry 4 months, we have had nearly as much rain in the last week as we had all that time, accompanied by strong winds. There has been many a sting in the tail so we are watching Noel carefully. Since yesterday it has been raining and raining and raining. We have had quite a bit of rain for Bani lately and the slugs have been coming into the house.. I had not checked to see what was happening (we had visitors from the States so were otherwise occupied and two of them were sleeping in the computer room) but now find Noel is in the process of passing. Since just before noon Saturday we have had rain with a few un-rainy periods. The dogs were looking to go for their walk and I think my companion took them out. They love their walk and let us know when 5 p.m. comes every day. We have had so much rain that I think you can actually see the grass growing! Yesterday we had thunder and lightning and the tree across the road was hit and knocked out our inverter so I sure hope we don't lose our lights this evening or it will be back to kerosene lamps. Church attendance was way down this morning and I can assure you that if I was not in charge of the music, I would not have gone as I had been Saturday afternoon. Besides the rain, it is cold! We are all walking around with sweaters and socks. Of course, since there has been so much rain, they have shut off the water, which is normal when the water in the river is high as they don't want the silt to get into the system. It looks as if we will have to put up with more rain at least until tomorrow. At least there are no high winds. Things could be worse and this Noel could have been a strong hurricane. Soi, I guess we can put up with a little discomfort. Weather over here is very wet, it hasn't stop raining since yesterday at noon or so. I remember that around 1PM yesterday, I was sitting on my table having my lunch when suddenly the wind pick up and started to blow, a little bit gusty, I had to restrain our gazebo with heavy stuff. And so now I am looking at the radar and find out that we have a tropical depression disturbing us, hmmm, I don't know but probably our mountain system will slow it down. Then from there is all about the rain, currently, light rain, cool temps (23ºC that is very cool for this time of the day). I have to pick up my dad and his wife at 1PM on the airport coming from New Jersey, I hope their arrival suits OK. The blob arrived at noon!!!! Grey skies, rain, some wind for a while, now just drizzle and humidity. Looks like its going to be like that all night. Awoke this morning to blue skies, cool breeze from the NE, the big bad blog is east of us, moving slowly west. Hope it runs out of water by the time it gets to us.....wishfull thinking. Today it has been rainy, grey and gusty. The bad new is that the blob is still east of us, and reading the reports from the Menores, we are in for a really wet weekend. The sun comes out for a little while giving short lived hope every now and then, no luck. The good news is that I finished my paintings ( Xmas present for the women in my family, all 12 of them!!!) and they are now varnished. One of this days I will write my report in my language, español. Gringo talk is sometimes hard for me, ha ha ha !! Weather here has settled between nice and very nice with the ocacional shower (specially at tee time) early afternoon.Will somebody talk Miss Mermaid into writing a book....? Yesterday took a one day ride to Santiago, our second largest city, some 1.5 million. It was a gift to my eyes to see our countryside like an 120 mile long garden. Just beautifull due to all the recent rains. Goes to proof that rain is good!!!! Being today golfing day lets see what the rain gods brings!!!!! Our "geriofoursome" does not stand well under the weather. There may not be any significant "STORMS" out there on the sat, but the DR has been getting drenched with rain and zapped with LOTS of lightening. There are major alerts for flooding in about half the provinces with the East and South coasts taking the heaviest hit. Many roads on the South coast are now flooding daily and if we get any break between down pours, the water just sits for hours before slowly draining. Needless to say, any green areas are quite water logged. Our rental villa on the S coast has had water literally flowing down the INSIDE steps several days this week (and I have almost gone flying on my tail because the floors are so slick.) Yesterday brought the S coast some decent waves (to Playa Caribe at least) and we are hoping for some 6-8 ft surf for Saturday. Our sleep has been quite disturbed due to the incessant flashing of lightening and booming thunder. It is exciting on the one hand and yet does get tiresome at 3AM when it feels like the concrete walls are caving in. As a result of all the rain, the ants, cien pies (giant centipedes) and tarantulas are out seeking refuge in the houses. On a positive note, the frogs are singing for the first time in months and I just love that purring noise they make at the end of a long song! Wife and myself took our early morning walk, 30 mi as prescribed, everything looked nice and washed, trees extragreen and nice and cool temps. Again last night, the son et lumiere show with three solid hours of rain...this morning the sun is out, a bit warm and humid but tolerable. Last night, just after midnight we had a display of sound and light followed by heavy rains. This morning, gray cool, more rain. Good day to cacht up with lots of neglected chores....Just checked the satelite view and we are in a BIG BLOB. it seems every weekend there are two or three tournaments.....big thing here. by ... :) ) as conditions are not favourable in its path. In SD nice cool reeze from the north, a bit hazy, not much, clear skies. Praying for those in Felix´s path. Keep safe. computer models for Invest 98 have seen a right turn to the NW. will organize itself, I hate to think about a possible 'Gabrielle'. Felix is passing our meridian some 400 miles south. Good ridance. Here, sunny, a bit hazy, winds mild from the north, seems Felix is drawing wind from way our there. Deep safe those in Felix´s path. In Santo Domingo could not be nicer, sunny, warm, clear. Felix seems to be heading the way of Dean, my heart goes to those in its path. Keep safe. Today we have another disturbed area to worry about, this one is in a bad position for Hispaniola, will keep an eye on it. Please God, look after those in Felix s `path. Was away during the time of Dean. Could not report on weather in Sto. Dgo., sorry. New home for Mom, no cleanup required. All starts here. I forgot to say on my last post that I called someone that took off to Pedernales this morning to inspect how things are doing over there and I was answered that there were little or no damage at all, of course winds were slightly more speedy there than here, but it was not as expected, I will tell more details later if necessary. For tourists that have plans for travel to our homeland for vacations, call your travel agent or contact the hotel you plan to travel, as some preventive evacuation occurred from little hotels to bigger ones that were in better conditions to deal with Dean, also it is smart to listen to your local government for updates to their citizens about Caribbean conditions and the Dominican Republic. Jamaica will take the worst part of the Antilles island as it will be facing a more powerful Dean than the lesser Antilles, I don't believe Jamaica will be safe for tourists in the immediate future, but is is always smart to call your travel agents about conditions in your destination and listen to the news. My thoughts and prayers for Jamaica, please guys keep yourself safe and we will want to hear from you about your local conditions. For us Dean is history, but is must admit that is a bit ironically that we are feeling worst weather right now than when Dean was very close to Santo Domingo city yesterday at 4:00PM local time. I had to go upstairs to shut the windows and doors because it was quite gusty and was raining hard, also early this morning was raining, but the gusts are calm now, is a bit breeze, by looking at all this I gotta say that the tail of Dean is quite active, is stuffed with wind and rain, funny uh? In the night some rainshowers, nothing happend that we were expecting, pure luck we had ! Dean is gone for us and it was not as expected, for good, Santo Domingo dogded the bullet, could Pedernales did as well? I'll report it on the morning. Currently, some clouds, no rain and no wind, we didn't got any wind gust neither. 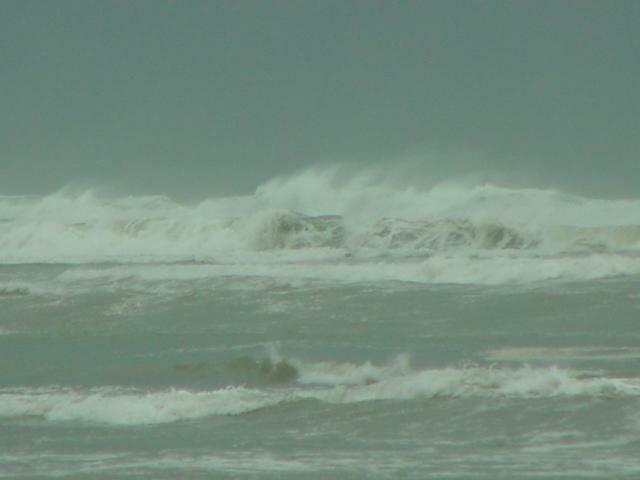 The only part of the island that got windy was Barahona and Pedernales, specially Pedernales. At least 22 flights cancelled in Las Americas Int't airpot. Dean still a Cat-4, compact though, storm winds didn't reach Santo Domingo for few km, I gotta guess. I guess we where lucky as NOAA reports said this area would have 50~60% chances of getting TS winds, pero el viento ha brillado por su ausencia. Next is Dean scratching the south of Haiti's coast and then Jamaica. Well, Dean has passed us in Bani, an hour west of Santo Domingo. We have had a couple of heavy rain, but only for about five or ten minutes. Also, there were some strong winds, but nothing that faintly resembled a hurricane. Thanks be to God! Now we can un-batten the hatches and keep watching to see what happens next. Sad to report this, but Dean has made it first victim on the Dominican Republic. I'm not sure whether is about a Dominican or Haitian or else, but at least El Caribe media reports is a 16 years old Haitian that recklessly got close to the shore and got beat by the high tides and the rocky coast. Authorities are warning against the folly attitude of tourists and residents not to get close to the coast, but the amazing waves are just attracting people like a Medusa to its victims. Lets hope no more victims occur. As for the weather, nothing have changed from my last report. the wind was moderate and only a bit gusty at times. blue sky to the north and dark low clouds to the south. will stay with us for the rest of the hurricane season. Our best wishes are now with all the people on Jamaica. Light rain, no winds at all yet, just light breeze from time to time. Santo Domingo isn't complete free at all yet from Dean, closest point eye will get is within 2.1 hours from now according to the how close it can get tool. TS wind range reached the very tip of the coast line however we are not getting any wind, any gust, no nothing, and if that is what is happening here on south coast, I bet north coast is even more calm, but only correspondents from those locations can tell. The only unusual thing is the high tides. Authorities are focusing on Pedernales and southwest part in general, as they will get, almost for sure, near 80kph gusty winds. Enough said, is just like any wet night for Santo Domingo, so far. As night falls the winds are 25 knots gusting to 35+, sea very rough and heavy rain starting to fall. Barometer slightly down at 28.9inches (1012mb). Politur, doing a good job, (?1st time? 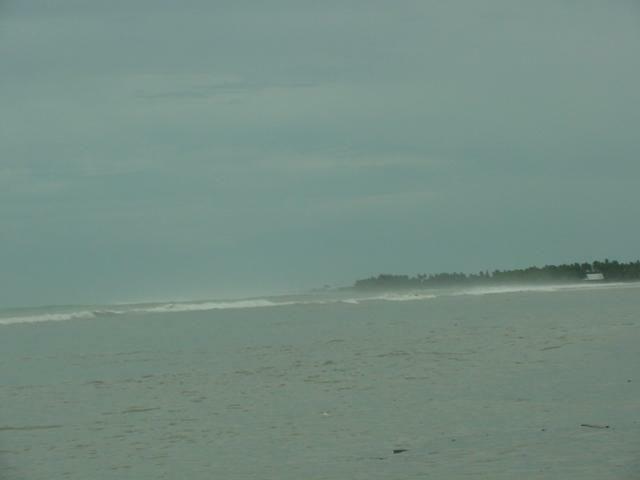 ), sweeped the beach empty and try to keep even the last "loco" away from committing suicide. It is not just the strong/brutal water but more the trees/wood/garbage that you don't see that can hit you and if you fall, game over is a good possibility. Slight rain, lightgray sky in the east with blue spots. 2.15 pm and wind at 15-20kt gusting higher, thunder but no lightning. Sea higher and quite rough. 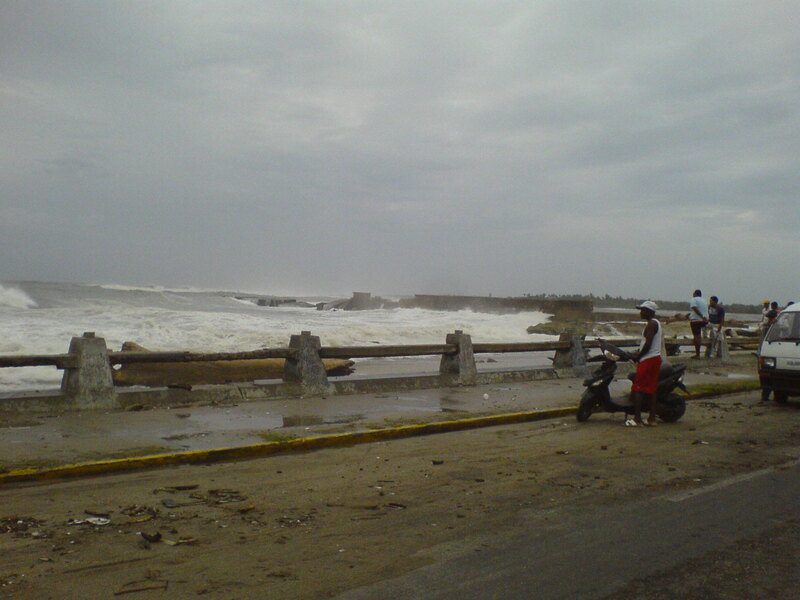 In Santo Domingo, capital city of Distrito Nacional head province and the Dominican Republic: Currently, overcasted, light rain and no wind, very high tides, too dangerous to walk or drive by the pier avenue. After stopping all activities where I work at 12PM, I couldn't resist to drive to the coastline avenue (G. W. Ave.) to take a look. I was in shock when I finally reach the avenue when exiting on the Núñez de Cáceres ramp, though the avenue was closed so I had to made u-turn to a parallel avenue and find the safest spot and opened for public. I found some more people staring at the amazing high tides braking in our high rocky shores. Sea was gray and filled with garbage, pitiful. Due to the closeness of the sea to the street, transportation authorities (AMET) closed most of the avenue, leaving some "safe spots" (it depends on if you behave before the situation) to stop by and look. Gas stations, supermarkets and other groceries stores are showing some more activities than usual. Government is doing coordination with public institutes to keep citizens safe, however, is normal that not enough is done so if institutions are not there helping you, PLEASE HELP YOURSELF. Don't stay near any kind of natural water resources (ríos, arroyos y cañadas), better stay in your concrete house or apartment than a wooden one. STAY AT HOME, if you don't have anything to do outside, then take the quickest way to home. The Dominican Republic will not get direct hit by Dean, but some of its effect will be felt within the next couple of hours, specially on the southwestern side of the country. Still have power, but our building has emergency generators. at the coast there's probably no rainfall (yet). Waves are getting huge, i was (stupid enough) to take a walk on the new pier, and i felt that i was walking the dutch coast again during one of their autummstorms. The (un)famous "underwater" parking garage project needs just a liitle push from the sea to become "Lago Juan Dolio"
We are feeling the effects of one of the feeder bands here although the barometer is steady at 1014mb, with a high thin cloud cover and temperature of 29.7c with humidity of 77% at 9am. Unusually we have a slowly increasing light breeze from a dead calm at 7am - normally the winds get up at midday for the kitesurfers. We had some scattered showers at night, nothing big though. low clouds; gusty winds from the north, 5 to 15 kts. Temperature 25ºC; rel. humidity 82%,; falling pressure. More clouds moving as I write. Beautiful morning, half of the sky is clear, looking at the horizon you can see and overcasted curved group of clouds coming, I guess I catch the outer band of Dean over the city just in time, unusual soft breeze, I'm not sure whether to associate it with Dean, but just wanted to say is a Beautiful morning over Santo Domingo, D.N. Dean is expected to be upgraded to Cat-5, that puts Jamaica on the eye of the bull, my thoughts and prayers for the residents of Jamaica, as projected path says you guys will get a DIRECT HIT. - "Huracán de grandes ligas pasará hoy frente a nosotros"
...Popular newspaper Diario Libre will post on morning edition this Saturday (something like "Big hurricane will pass in front of us") while we watch our coasts very amazed about this huge baby, now Cat-4, local authorities are issuing warning to south coast residents. Local media is from this Friday warning and keeping us posted about Dean. The local meteorology office issued red alert for La Altagracia, La Romana, San Pedro de Macorís, Santo Domingo, Distrito Nacional (where I am ^_^), San Cristóbal, Peravia y Bahoruco and green alert for the rest of the country. Hurricane watch is issued from Barahona to Pedernales, meanwhile Tropical Storm watch is issued from Cabo Engaño to Azua. I'll keep you posted about any kind of interesting stuff happening on the metropolitan area, to all other correspondent from Dominican Republic (Kurt, mountainfrog, Dolores Vicioso, alejandro read and carol read) good job, keep up a good work, wishing to see your reports about how things develop in your local area. Here some news from Punta Cana, Dominican Republic, there is a little breeze, some clouds, but nothing else, some people rushed to the supermarket to get provisions, the gas station was very busy, cars getting gas, I work with tourists for 15 years in Punta Cana making tours with beach buggy’s. We just secured are vehicles, has we expect allot of rain. Waw my oldest car, He’s gone stay outside; well it’s an expert, survived Hurricane George. Dean is stronger, is now a major hurricane and is increasing on its size. Dean is stronger and its wind range is bigger. Projected path, thankfully, still the same. Therefor: The areas that I mentioned on last 2 previous posts, about chances of getting TS winds, are, well, prob 10% higher. ONAMET is issuing advisories for small ships (embarcaciones marítimas, excuse me my lack of English), should be in seaports (deben permanecer en los puertos) as Dean is generating 4 feet higher tides. Freaking news: Dean could reach Cat 4 on the next 24 hours. This will get very interesting from now on, tomorrow morning I still have to go to work, I'll take personal precautions, however it will depend on how the morning seems to be. between us even as far north as Samaná. My best wishes are with all who may suffer from that storm. "At the moment it looks as if we're 'home free', excepting for some rain and bigger waves and a bit of surge" from the 11 pm report. As the storm enters our vicinity there is a lot of nervousness, given the past experiences with fickle-minded hurricanes. So far, that Dean has been sticking to its track that brings it well south of the island, is good news for the DR.
Long weekend holiday plans are a go -- am headed myself for the north coast. Will be interesting to see what kind of rain and surge a storm so south of us will bring. At 10:00PM local time, ONAMET (National Office of Meteorology) issued Tropical Storm watch for Cabo Engaño to Pedernales (this includes Santo Domingo, city of near 3 million of people), means the very eastern tip to the very southern tip of the country. This means that Tropical Storm associated effects might affect these areas within 36 hours. The government gave green light to the National Commission of Emergency (COE) to prepare the citizens for the impact of this storm, warnings should appear on the news at first time, tomorrow, Friday 17th. - Dean might not be a danger for Dominican Rep.
As local authorities says, Cat 2 Hurricane Dean will not be that dangerous for our Nation, but warns citizens to watch closely the storm track, the projected path could detour a bit north and then it could get a bit messy over here. According to NOAA projections, the highest chance that we get to feel TS winds are 60% for the southern tip of Pedernales and Barahona provinces, 50% for Azua and Peravia provinces, The rest of our homeland 40~50% but north coast, with 30%. Most chances we get hurricane speed whatsoever are just 5%, but that might increase in the future, as said before, we will keep a good eye on this tropical system as it moves on the Caribbean sea. of TS Dean changed from the NORTH of DR to the SOUTH. will keep the system on its western path. becoming a rather strong hurricane. in the hills, 73% rel. humidity. more hot beautifull weather in Sto. Domingo but keeping an eye on the nasty baby growing in the east. AT LAST, A SUNNY SUNDAY !!!!!! WENT TO THE BEACH HOUSE IN PALMAR DE OCOA, BRIGHT SUNNY DAY, HOT AND DRY. WELLCOME. KEEPING AN WEARY EYE IN THE NEW BLOBITO. My wife just informed me that we have some dorado heads in the freezer good for a fish soup......cant wait. Dominican version of a boullabaise. Some spirits wont hurt!!! Keep dry ( I doubt it ). The south coast has been getting some thunderstorms in the evening, but here on the north coast it has been dry and hot, hot, hot - perfect for the visitors but more taxing for those of us with gardens. In July we had only 2.2 inches of rain and even the weeds are starting to wilt! To compensate, we have seen some wonderful sunsets while walking the dogs along the beach as night falls. Every afternoon we seem to host a passing wave. No matter how nice its been in the morning about four in the afternoon, skies will darken, wind will pick up and we will get drenched in a heavy downpour that lasts for about 45 mins. then it clears up and we enjoy a nice evening. Please forgive my sintaxis, for english is not my native language. 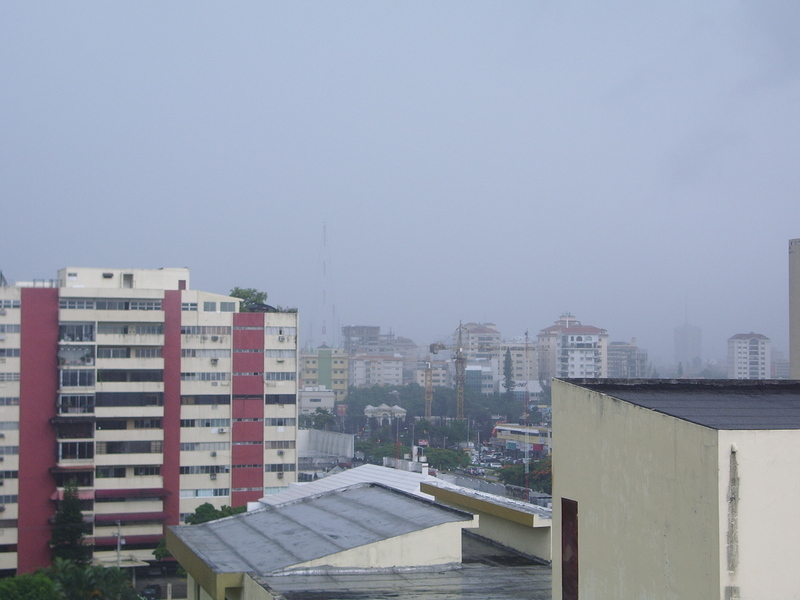 It´s 4/00 PM in Sto Domingo, slight overcast, wind moderate from the NE, very warm, all normal with weather to the SE. Keeping an eye on what Dave called ¨the blob¨. It´s 4.45 PM in Santo Domingo, we just had over two solids hours of heavy rain, thunderbolts, some wind belonging to a tropical wave traveling west. Looks like might get some more later, hioe not. Good night for a sancocho.......and some spitits! It's being long time, but weather overall on the past month has just being dry and sunny, with few rain, not big deal. But after all these hot and dry days, finally some welcome rain, temperature yesterday and now has being quite fresh and comfortable, thunders grumbling. I took these two pictures to show you how it looks like right now over the center of Santo Domingo. Yes, I took a leave of absence.......back in business!!! a little wind, not bad. the whole country is green. When it rains in the south coast, the north coast has little rain, life in the tropics. Still no sign of the bad guys, no hurry. - very dry but rain threatening! It has been very dry with only 3 inches of rain during June, and only 1.2 inches so far in July. But the thunder has been grumbling for the last hour or so, and the sky looks threatening so maybe we will get a good soaking. The grass here on the north coast is looking unusually brown and we had a large grassfire nearby yesterday afternoon. But what is a blessing here on the coast often causes problems for the folks in the mountains who suffer flash floods. So far this year we have had 59.75 inches of rain. It has suddenly got very dark so I will post this before something cuts me off!!! I cant believe that the autorities in Tortola endanger the residence permit of Tortola´s best spokeperson. Nobody there speaks with a stronger voice fr the beauties and virtues of LIFE INTHE ISLANDS. than Miss Mermaid. If it comes to that, she will allways have a home in the Dominican. Weather her hot, hazy, beautifull. Well, it's still raining! 8.4 inches this week! 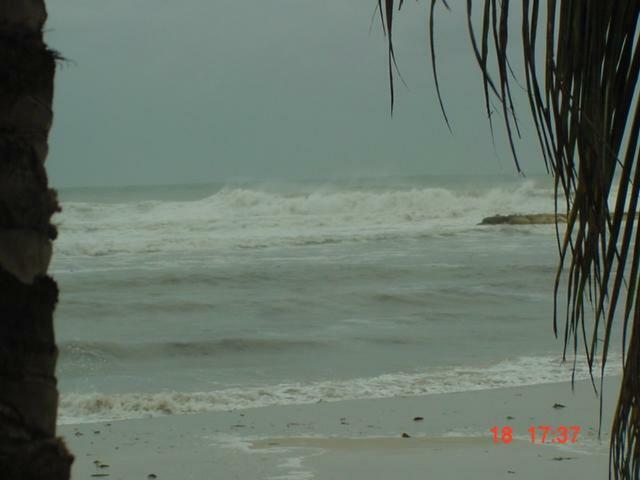 The north coast is on Red Alert and we are experiencing a lot of flooding and landslides from the downpours. 5 people dead and over 5,000 evacuated from their homes. The rainfall to date this year is 56.75 inches with May 9.2 inches, April 8.55, March 17.05, February 8.45 and January 13.5. Stay safe everyone! We had a busy morning, dealing with lots and lots of rain, with heavy Electrical Activity, with lighting striking right over Santo Domingo, loud thunders, it was an authentic T-Storm, some times was raining a lot, sometimes not, currently, it's all calm and is mostly cloudy. However, Cibao region (north side of the island) is taking the worst from this tropical disturbance, the National Commission of Emergency (COE in Spanish) declared maximum alert for four provinces: Espaillat, Sánchez Ramírez, Duarte and La Vega. This weather has cost 5 lifes. Evacuee's toll is 5,519 around the country due prevention of flooding around rivers and other types of water sources. Click a photo to view a larger version on Yahoo! Photos. See links above for more options. Last night we had a huge thunderstorm that lasted for hours, with very strong winds, pink lightning and thunder that shook the house. Only 1.5 inches of rain though and the main storm looked as if it was out to sea. I was glad I'd had the coconuts cut down as the winds were very strong. Although we are usually spared the worst of the hurricanes, our preparations are underway. Tomorrow the gardeners will cut down the coconuts off the trees in the garden - those babies come down like bombs and cause lots of damage especially when the wind speeds are high. The diesel tank for the generator is topped up and a good supply of water and tinned goods laid in. It is very hot early this year and we wait to see what happens! Take care everyone. - Dust, dust lots of dust!! My goodness!! I knew this thing was the "Sahara dust issue", the air is so hot, feels like humid, but you can't see that far, you can appreciate very clear that there is dust in the air, I noticed it yesterday, but I feel like it's stronger now. I wanted to take some pictures your you but I can't find the camera anywhere, seems like somebody borrowed it. Happy to be back here, reporting for you all. I've been away from weather issues long ago, but since last night an event caught my attention and I want to share it. Around 1AM local time, we had heavy showers + thunders, and ever since its being raining with long pauses. 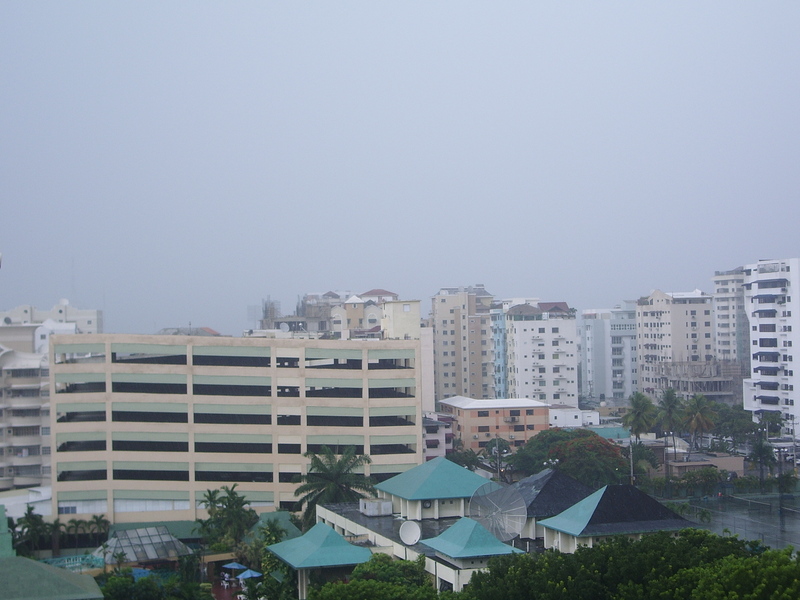 Currently the skies are dark over Santo Domingo so we are expecting more bad weather. And talking about bad weather, Dajabon's province, in the northwesternern part of the island, was struggeld by a tornado that causes significant damage to the capital of that province, tearing down trees, wires, wounding 22 people and damaging a considerable amount of houses. Governorn declared the municipality in emergency status. Damage calculations are up to RD$150 million (around € 3.44 million). My thoughts and prayers for the poeple of Dajabon. Back home and having solved computer problems, happy to report back. Here on the north coast we have had an April rainfall total of 8.55 inches, bringing the total since January 1st to 47.55 inches. Good luck to everyone sailing in the Stanford Antigua Sailing Week - fair winds!